The goal of the organization is to facilitate advancement, networking, and community service amongst the black millennials living and working in the Santa Barbara area. Besides their mixers, SBYBP holds quarterly workshops on varied themes like financial literacy, mental health, and professional development. They also do community service activities like beach clean-ups and site work for Habitat for Humanity. Quienna was born and raised on Edwards Air Force Base. “I was a military brat,” she says. 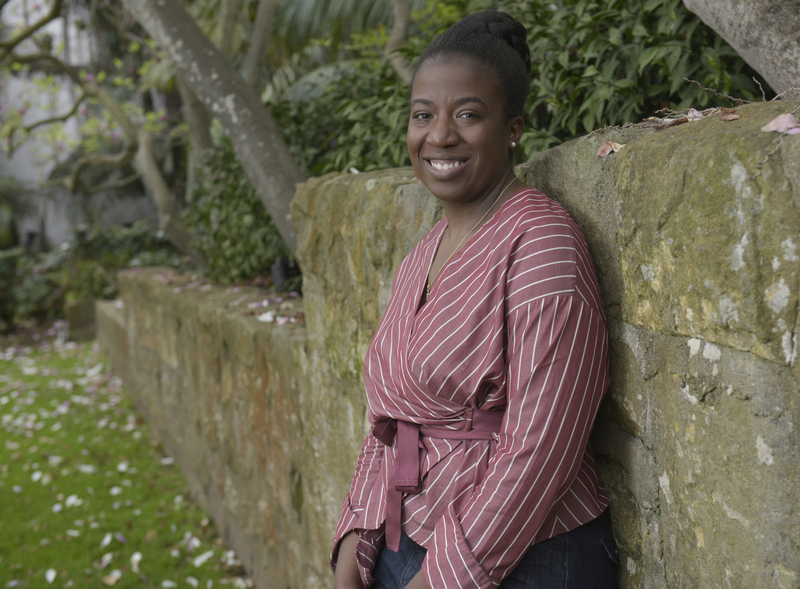 “Sonic booms were a common thing.” A childhood friend whose family was stationed at Vandenberg Air Force Base introduced her to Santa Barbara, and she has fond memories of spending time on State Street. When it came to college, she went to UCSB and got a degree in feminist studies with a minor in education. In 2011, she started working part-time for the Goleta company Inogen and was hired full-time after she graduated in 2012. In 2014, it was time to try something else, so she got her current job as a certified property appraiser for the County of Santa Barbara Assessor’s office. Quienna Broadnax answers the Proust Questionnaire. Aside from helping to cultivate community in Santa Barbara over the past few years, I would say running the Paris Marathon some years ago through involvement with the Leukemia and Lymphoma Society’s “Team in Training.” It’s the only time in my life that I’ve ever experienced so many different emotions in a short amount of time. Plus, if you knew me growing up, running 26 miles would be one of the last things you would expect me to do. My greatest fear is not using my God-given talents to their greatest potential. Life can get so busy sometimes, but I never want to be so busy that I am not making the most of opportunities. I cannot pick just one because there have been so many who have sacrificed and caused a change in the climate, so without abolitionists and civil rights leaders, without educational pioneers, without the suffragettes, without trailblazers in the medical field, I could not have gotten this far. During the day, I am a property appraiser with the County of Santa Barbara and I have had the opportunity of seeing many different types of properties from Lompoc to Carpinteria. After work, I serve as the president of Santa Barbara Young Black Professionals (SBYBP), which I founded in 2016. SBYBP serves as an uplifting, community meeting place and it gives me joy when I receive positive feedback that a member found housing, services, network connection, employment, or just had a great time at one of our monthly events. I experience the most happiness when I am with friends and family sharing a meal on a nice warm day. There’s nothing like being with loved ones, laughing, catching up, and enjoying delicious food. Who so you most admire? I would have to say my mom (or “momager” as I lovingly call her)! She instilled very valuable lessons in me and is my biggest supporter. After the rent I pay each month to live here, my biggest extravagance is travel. I make it a point to see someplace new each year. A couple of my favorite destinations have included Istanbul and Athens. I definitely have a thing for the Mediterranean. Inquisitive and optimistic. A mentor recently advised me to ask myself, “How?” when dealing with a problem in order to see the possibilities and to arrive at creative solutions. Depth. I seem to vibe more with people who are honest, real, and willing to have meaningful conversation. I’d say I am a pretty good judge of character so if someone is being disingenuous, I can tell pretty quickly. Humor. I love friends who can make me laugh and get my, sometimes corny, jokes. People tell me they enjoy the faces that I make when I’m reacting to stories. I guess I can be pretty expressive. Emojis! I use a lot of them when I’m texting. I definitely overuse the laughing, prayer hands, and heart emojis! I would love to be able to sing or paint well. I greatly admire the arts and how expressive one can be through different media. I’ve always been the short one in my family so, if anything, I would want to grow a couple inches in height. I think it would be nice to live abroad in Paris and travel across Europe, but, of course, there’s no place like Santa Barbara. A treasured item is a cartouche I received from my dad when he was stationed in the Middle East. This is one of the things that really made me interested in other cultures and seeing the world at an early age. Right now, a good joke/meme/post will crack me up. There are some gems out there on the internet! “Keep going!” I’ve been finding that life is about perseverance and learning from challenges. It’s always a good reminder for me to keep pressing on in the midsts of hard times or even when navigating uncharted territories.